After we left my in-law's shore house, we drove up the coast of North Carolina to Nag's Head. My in-laws' home is all the way at the bottom of the state, so it took about five hours to get there. Thank you, God, for DSIs and portable video players. On our way there, we drove past Roanoke Island. I read about Virginia Dare on my iPhone, but we didn't have time to check it out. The Brew Thru wasn't the only reason that we were interested in Nag's Head. We had heard that the beaches were beautiful. They were, but the water was a lot colder than the beaches a little further south. The town itself was nice — closer to civilization than our previous stop, but not over developed. We ate at a great North Carolina-style barbeque joint, Pigman's Bar-B-Que. Steve walked out with a big grin, a belly full of pork, and two bottles of their barbeque sauce. 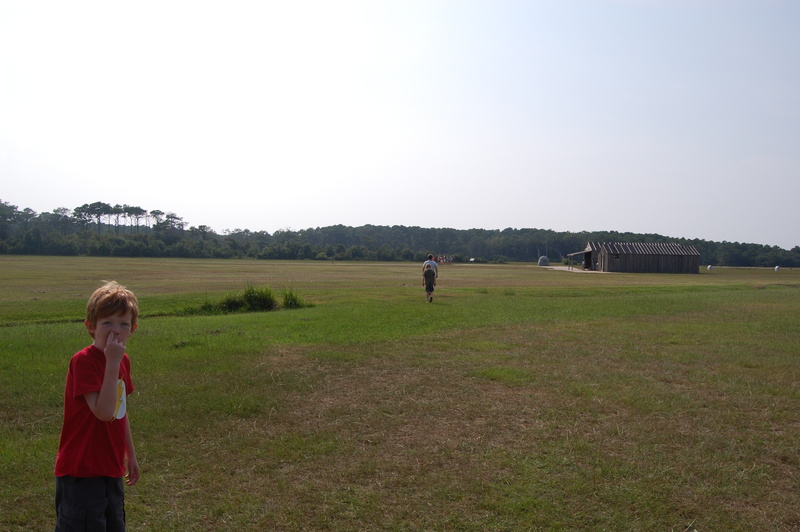 Both Steve and I were anxious to check out the Wright Brothers National Park. I am fascinated with them, because I admire geeks. The brothers' parents were eccentrics that encouraged learning. Later, the brothers developed their ideas while summering at a cabin with a few other geeks. There's got to be something about putting a bunch of geeks in a small house for a while that helps them come up with smart ideas. Kinda like, Bill Gates in a garage. So, Steve and I geeked out at their social history and the well planned park. Steve admired the National Park Passport in the gift shop. And the kids are miserable. 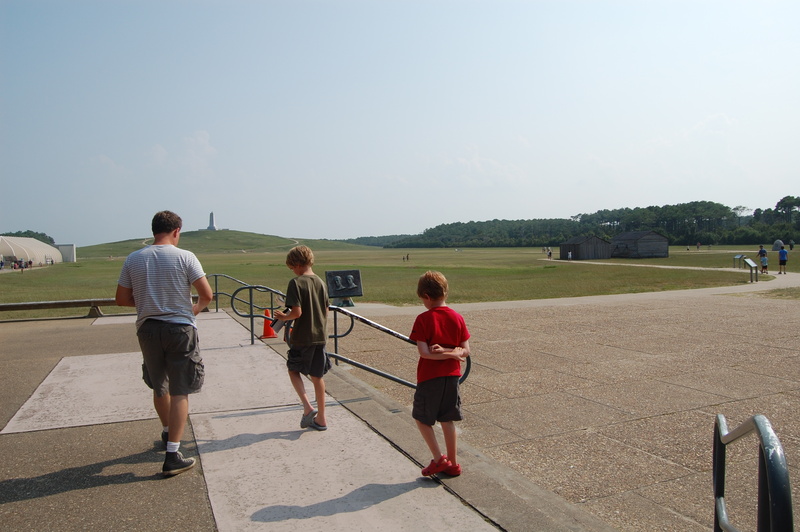 Do they care about the social history of the Wright Brothers? No, they do not. Do they admire the smart, modern lines of the park? No, they do not. And it's 100 degrees in the field. Because I love torturing my children, I take them to National Parks. We got the passport when we were in Yellowstone. E likes to stamp things and look at maps and stuff. It kept him pretty well occupied. It’s pretty much easy to get our kids to do anything if we promise them ice cream after. 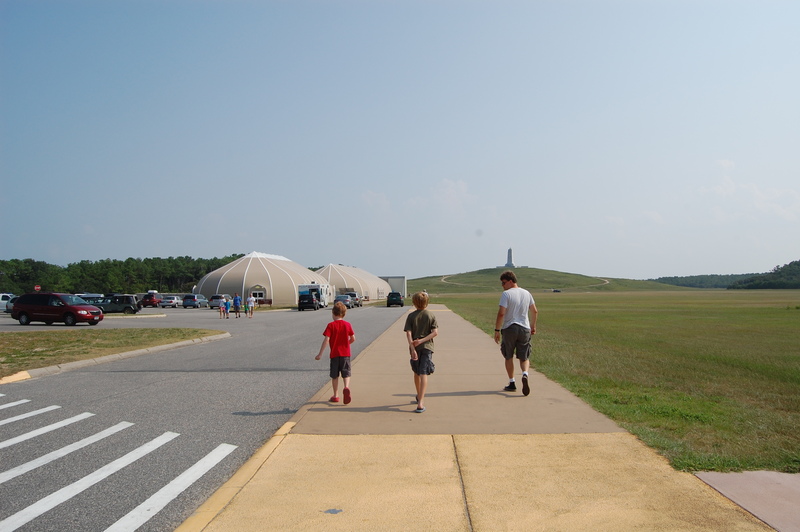 Going to Kitty-Hawk sounds great. I like to torture my daughter by making her do math facts and clean up after herself. And that reminds me, I need to harass her about the math facts. 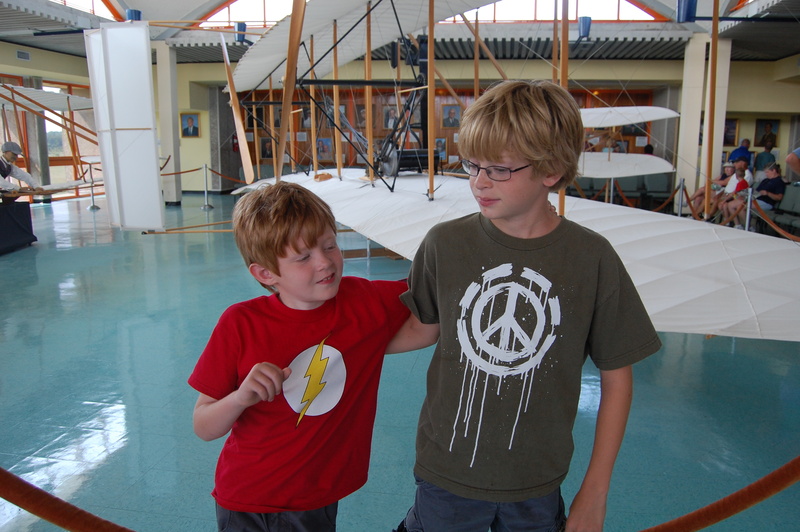 My son really enjoyed the Wright Brothers’ exhibit at the Air & Space Museum in DC. They drive us crazy by not being willing to look at all the beautiful scenery outside when we’re driving, though. We have several passports, now, to satisfy the stamping desires of different children. But never mind that. There are TWO KINDS of NC-style BBQ, and the folks in the western part of the state are irritated that you don’t acknowledge that. I live in the middle. We can get both kinds. YUM.